This is the exact .38 Special load that was most trusted by many federal agents and law enforcement officers during the era of the service revolver. 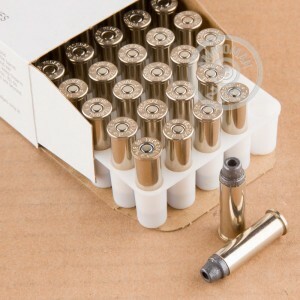 These rounds are loaded to +P pressure and utilize an lead semi-wadcutter with a hollow-point cavity (LSWCHP) weighing in at the ideal 158 grains. The combination results in deadly performance due to high velocity, deep penetration, gracious expansion, and great accuracy even from the short barrels of pocket revolvers. The bullet shape and performance not only makes a great defense round but leaves the cleanest, most discernible holes on target for match and training purposes. Federal Premium ammunition is manufactured in Minnesota and held to some of the tightest quality control standards in the industry. 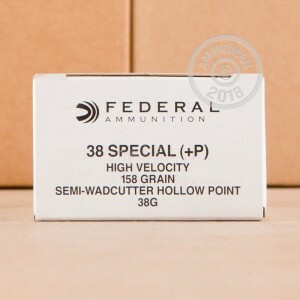 Federal is well known for its innovative designs for self-defense purposes as well as for the preservation of classics like these "FBI Load" .38 special rounds.